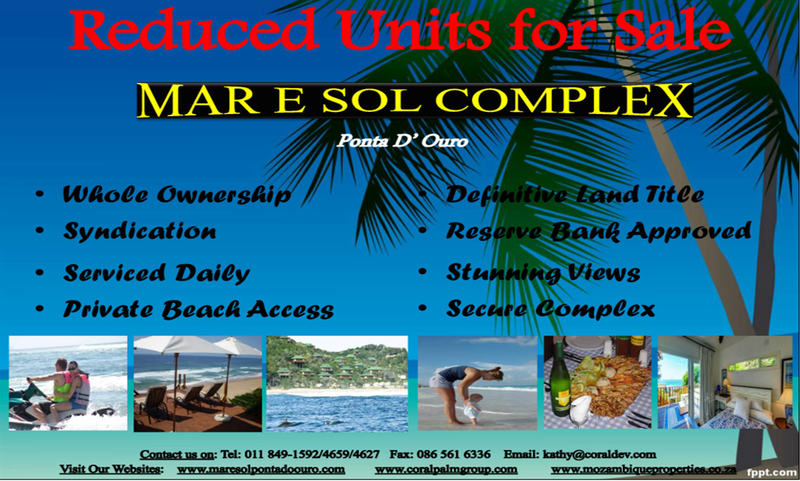 Located directly on the pristine Main Beach of Ponta D’ Ouro in southern Mozambique the Mar e Sol Complex is an upmarket holiday and residential Condominium estate catering for both tourists and residents alike. Crystal clear azure waters gently lap the shoreline whilst bottle nose dolphins frolic in the surf on the extremity of the naturally protected bay. The Complex is nestled in thick luscious dune forestation with views extending endlessly up the coastline and out over the tranquil sub-tropical ocean. The Complex is comprised of large and well appointed luxury wooden Villas all facing the coast with facilities ranging from self-catering, en-suite bathrooms to surrounding expansive sun drenched decks, swimming pools and upmarket amenities in each unit. The Complex encompasses an exclusive coastal theme whilst maintaining a high standard of service and maintenance from its friendly and efficient local staff compliment. In addition to holiday accommodation rentals the Mar e Sol Complex offers potential Investors the opportunity to purchase prime Real Estate located in one of the most lucratively realised and established developments in the area. 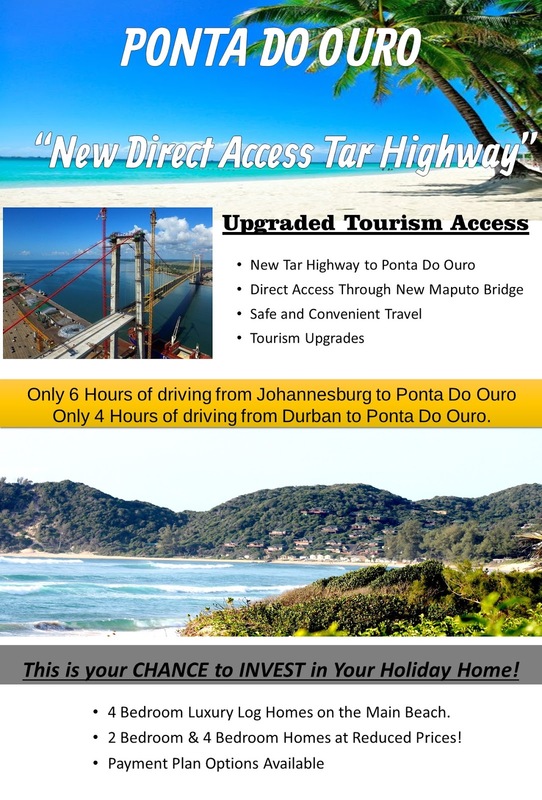 Located just 1 hour from Maputo, 6 hours from Johannesburg and 4 hours from Durban the Mar e Sol Tourism and Condominium Development offers both guests and speculators alike a magnificent opportunity to both enjoy the relaxing spectacular vistas plus invest into a long term stable venture that offers impressive returns and passive income through rentals if so required. Central and Reserve Bank approvals plus full rights afford investors perpetual stability and guaranteed returns on resales. Situado na pristina praia principal de Ponta D’ Ouro no sul de Moçambique, o Complexo Mar e Sol é um condomínio de luxo de férias e residencial tanto para turistas como para os próprios moradores. Águas azuis cristalinas banham a praia enquanto os golfinhos brincam nas ondas da baía natural protegida. O Complexo está aninhado na vegetação densa e luxuriante das dunas com vistas desafogadas para o tranquilo subtropical. O Complexo consiste em casas de madeira espaçosas bem equipadas, todas com cozinha própria, quartos com casa-de-banho privativa, amplas varandas banhadas pelo sol, piscina e acabamentos de qualidade superior. O Complexo ostenta um tema marítimo ao manter um serviço de elevada qualidade e manutenção da parte do seu pessoal simpático e eficiente. Além de hospedagem de férias, o Complexo Mar e Sol oferece aos potenciais investidores a oportunidade para comprar uma propriedade de prestígio num dos empreendimentos mais rentáveis e bem-estabelecidos na área. Disto a apenas 1 hora de Maputo, 6 horas de Joanesburgo e 4 horas de Durban, o Complexo Turístico e Condomínio Mar e Sol oferece aos turistas e aos especuladores uma magnífica oportunidade para gozar das espectaculares relaxantes vistas, conjugado a um investimento estável de longo prazo num empreendimento altamente rentável, passível de garantir rendimentos passíveis proveniente do aluguer das casas, se desejável. A aprovação dos Bancos Centrais de Moçambique e da África do Sul, assim como a posse de pleno direito oferecem aos investidores uma estabilidade perpétua e retornos garantidos aquando da revenda. Mozambique Adventure and Activities and Planning a Mozambique holiday.? We all know the pleasures of relaxing on sun-drenched shores. Enjoying some of the best seafood that Africa has to offer such as the all time favorite Fresh Prawns. While sipping cocktails on a white sandy beach while waiting for the sun slowly dip below the horizon. Even though all of this might sound really tempting. There is even more that you can expect from your Mozambique holiday. Surf the waves, scale the peaks, and explore the distant reaches of the world. Experience some of the most beautiful and pristine diving spots in the world on your next Mozambique holiday. With a plethora of marine animals to behold among the untouched coral reefs and secluded beaches. The sparkling waters of Mozambique has something to offer for all levels of scuba divers. For scuba divers, the question beckons: what elements make the perfect dive holiday? With endless white beaches bordered by paradise-like, sub-tropical vegetation on the one side and the most gorgeous light blue seas on the other, buffeted by coral reefs to explore in brilliant visibility; friendly hospitality; luxurious accommodation and, of course, a tantalizing variety of exotic fish, sharks and rare marine creatures, Mozambique has to be among the world’s premier dive destinations. Diving in Mozambique combines the best elements of a relaxing holiday with a diverse range of other activities to choose from such as snorkeling, kayaking, sailing, 4x4ing and dhow trips. We all know the incredible diversity and abundance of species that can be found in the pristine waters of Mozambique. Which is why it will come as no surprise that your Mozambique holiday will also offer some of the most exciting fishing opportunities known to man. Available all year round, Mozambique offers some of the best big game fishing in the world, and the commonly practiced “catch and release” principal helps with conservation efforts. The calm blue depths of the ocean waters at Ponta Do Ouro in Mozambique, just 2 hours from Kruger Park will overwhelm you. The majesty of the unknown appears to you in flashes of brilliance, silver slivers glide past you in the electric blueness; you are swimming side by side with the calmest and friendliest creatures of the ocean dolphins. Electric waves are being transferred beneath the veneer of the sublime: your endorphin’s are being stimulated through brain wave changes by interacting with these majestic creatures of the deep – energy transfer that stimulates happiness; the mysterious gift of euphoria given by these friendly creatures. 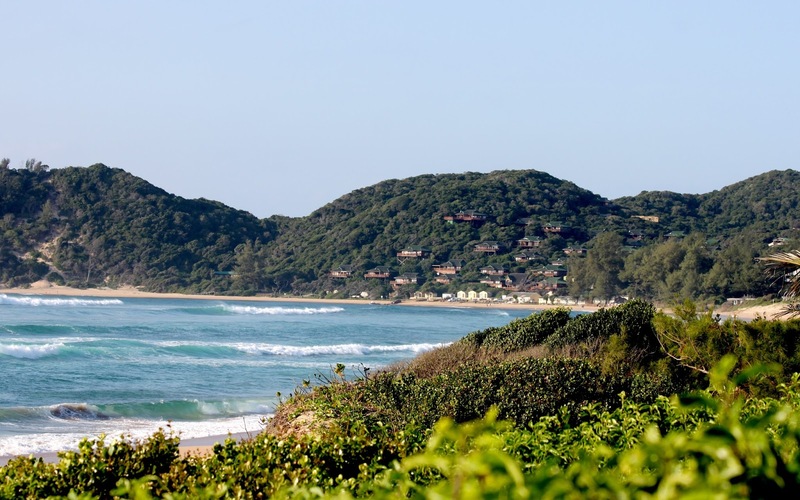 Ponto do Ouro is the most southern town in Mozambique, located on the border with South Africa. It is a 6 hour drive from Johannesburg, a 2 hour drive from Kruger National park and just 4 hours drive from Durban. Ponto do Ouro provides the opportunity for this awesome experience. Like many holiday destinations, Mozambique often touts its natural beauty while forgetting the any cultural treasures and historical destinations which offers more inquisitive visitors a look into the culture and history of this magnificent holiday destination. Holiday makers should consider visiting the Fort of San Sebastian, oldest fort still standing in sub-Saharan Africa. Other magnificent places to visit include the Museum of Sacred Art and Palace St Paul. A Mozambique holiday offers more opportunities and activities than one could ever mention, with whale watching, turtle tours, horseback riding, beach picnics and many more exciting adventures awaiting you. Make sure that you find out exactly what your Mozambique holiday has to offer, and make the most of your trip by indulging in more than just the magnificent fare and stunning beaches. Experience all that Mozambique has to offer, and enjoy the adventure of a lifetime. 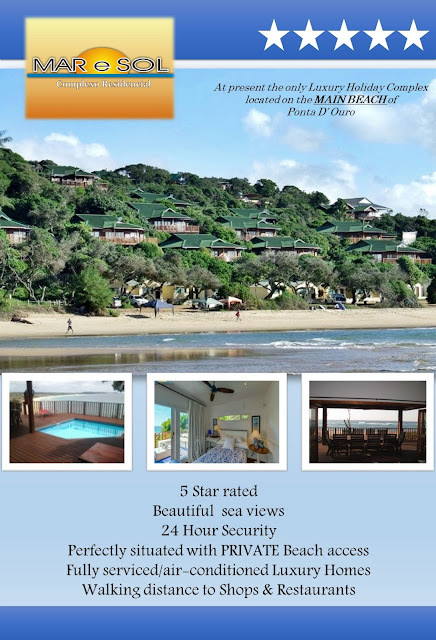 Ponta Mamoli in Mozambique is a secluded holiday destination and is only 25 kilometres from the Kosi Bay border post. It is also the best place to see the act of turtle nesting. Loggerhead and leather back female turtles come here to lay their eggs and can be seen from November until March nesting along the beaches. As soon as the sun goes down, and right through the night, they crawl along the beach, digging holes and laying up to 300 eggs. After this, they cover them with sand and crawl back down to the sea. Ponta Mamoli, a premier seaside and diving resort, is nested one of the most stunning and untouched bays in Southern Mozambique. The long and magnificent beach allows for snorkelling just off the beach, perfect diving reefs, fishing and most of all a place to forget about the rest of the world. It is truly an escape from everything. Water temperature ranges from 21 °C in winter, with a visibility of about 25 metres, to 28 °C in the summer, with a visibility of about 15 to 20 metres, and so allowing for excellent diving conditions throughout the year. Visit Ponta Mamoli to get a whole new perspective on the wonderful sights to see in Mozambique. Mozambique has, internationally, a reputation for the best marine life in the most beautiful setting. It is here that visitors will be amazed that it is indeed possible to go snorkelling with Whale Sharks. One of the best places for this is in Tofu Bay. Tofu Bay can be accessed from Inhambane by dhow or motorboat from the town of Maxixe. It has a huge stretch of absolutely golden sand dunes backing a pristine beach which surrounds a crystal clear bay with lodges hidden behind the palms giving the impression of completely untouched land. It also happens to sport the best diving available in Mozambique. The reefs off of Tofu Bay offer the opportunity to visitors to snorkel with Mantas and Whale Sharks year round. The main whale shark season is actually from November up until May but sightings are made throughout the year. The completely surreal experience of snorkelling with Whale Sharks is one not to be missed. These graceful creatures are the biggest fish in the sea, look like sharks and are the size of a whale. They can reach up to 12 meters in length and get to about 20 tons. Whale Sharks are incredibly fascinating creatures that are huge but harmless. They have no known predators, except for humans and are actually hunted for their soft meat, particularly in Taiwan. For scuba divers, the question beckons: what elements make the perfect dive holiday? With endless white beaches bordered by paradise-like, sub-tropical vegetation on the one side and the most gorgeous light blue seas on the other, buffeted by coral reefs to explore in brilliant visibility; friendly hospitality; luxurious accommodation and, of course, a tantalizing variety of exotic fish, sharks and rare marine creatures, Mozambique has to be among the world’s premier dive destinations. Diving in Mozambique combines the best elements of a relaxing holiday with a diverse range of other activities to choose from such as snorkeling, kayaking, sailing, 4x4ing and dhow trips. Daily boat trips to Inhaca and the Portuguese Islands of Mozambique bring you closer to the essence of Mozambique – with breath-taking tropical islands lined with never-ending, idyllic white beaches, unspoiled coral reefs to snorkel and dive, and picturesque views with which to enjoy sundowners, Inhaca and the Portuguese Islands are some of the most treasured gems of Mozambique. Inhaca is ideal for divers: staghorn and plate coral teeming with tropical and game fish, dolphins, whale sharks and manta rays, shark diving and ship-wreck diving are some of the attractions that make Inhaca and the Portuguese Islands world class diving destinations. Water temperatures vary between 22°C and roughly 30°C, and year-round visibility averages at 15m. Up-close encounters with ragged-tooth sharks, whale sharks and rare tropical fish leave you breathless. Walks and trails through the forest provide you with up-close encounters with exotic birdlife and vegetation. Local culture is rich in colour and diversity. Spend the day snorkelling, exploring untouched paradise-like beaches, visiting the lighthouse at Inhaca, the Marine Biological Centre, or rent a bicycle and saunter along the peaceful avenues with magnificent views of the Indian Ocean. Game fishing is another favoured activity. Evenings draw in with spectacular sunsets to be enjoyed with a sundowner on a dhow cruise. Accommodation is available on Inhaca islands. Daily boat trips to Inhaca and the Portuguese Islands of Mozambique typically include swimming and snorkelling at Portuguese Islands followed by a sumptuous traditional seafood lunch at Inhaca and the rest of the day spent touring Inhaca. With its expansive white sandy beaches, nature at its best, Mozambique and its surrounding islands have been an attraction for the typical sun worshiper as well as the water sports enthusiast. From the holidaymaker down to competitive sports, Mozambique calls out in its own unique voice. With this in mind, it should be mentioned that the words “Big Game Fishing” and Mozambique are almost synonymous with each other. For close to 50 years, Big Game Fishing has been a major attraction in Mozambique and consistently draws the die-hard fisherman back, year after year. The variety and abundance of species in this area is out of this world leaving the big game and fly fisherman in awe of this beautiful place and since fishing is excellent all year round it may become difficult to find a reason to leave. In addition to the wonder of Mozambique itself there are its 5 islands: Bazaruto, Benguerra, Maraque, Banque and Santa Carolina which lie along the historical Moçambican channel. Bazaruto is the premier fishing destination in Mozambique and offers Big Game Fishing on a world class level. Mid September until the end of December is the best time for Marlin fishing while Sailfish abound from April to August. Other smaller game fish such as the King Mackerel, Bonito, Travelli, and Queen Mackerel are available all year around. The “Tag and Release” principle is typical in these parts due to an ongoing Conservation project. On the other hand, if you are more adventurous and are looking to discover a new species, there is always Pemba Bay. It is an almost untouched fishing area and its real potential is largely unknown. With tourism on the rise, however, this little spot won’t be left alone much longer and has already started being opened up to the Big Game fisherman. In the heart of the bustling, energy-charged streets of Maputo, between wide avenues lined kaleidoscopically with the contrasting purples and greens of jacaranda palm trees, Jardim Tunduru Botanical Gardens provides welcome respite. The gardens were designed by Englishman Thomas Honney in the late 19th Century. Exploring Maputo on foot provides rich reward to the curious traveller, and stumbling on the Jardim Tunduru Botanical Gardens enriches travellers with shade and enchanting serenity amidst beautiful sub-tropical surroundings. The entrance of the gardens is presided over by a statue of Samora Machel, the first president of Mozambique. Discovering Maputo by foot also gives travellers a chance to drink coffee in languorous street-side cafes, or dine, al fresco, in the cool evenings, watching the sun sink below the horizon. While exploring other attractions such as the Cathedral in Independence Square, the Natural History Museum and various statues that watch over the city, a break at the Jardim Tunduru Botanical Gardens is most welcome. Taking a day out of any Mozambique vacation that is complete with soft, sandy beaches; diving and snorkelling; to explore Maputo on foot is well worth the experience, and an ideal way to discover the intriguing, sometimes fierce and colourful historical and cultural heritage of Mozambique. Picnicking in the gardens is the perfect way to have lunch while in the city. Visitors will also be surprised to discover tennis courts within the gardens, and a restaurant, where visitors may enjoy a refreshing cocktail, or a light meal. Mozambique: a dreamy tourist destination with untouched beaches, warm Indian Ocean waters, and paradise-like surroundings, embedded within which is a rich cultural and historical heritage dating back centuries. Vasco da Gama first explored Mozambique in 1458, and shortly thereafter Mozambique was colonised by the Portuguese government. The history of the struggle that took place in this fascinating country of contrasts in centuries to come is an astounding journey into colonialism in Africa. The struggle for independence is well-documented at the Museum of the Revolution in Maputo. Taking a trip to the Museum of the Revolution in Maputo will drench you in the blood, sweat and tears of defiant Mozambicans who fought against forced African labour. The call to arms against large industrial and mining companies that effectively ran the country was taken up by the Front for the Liberation of Mozambique (FRELIMO). Be fascinated by the way the revolution gained momentum, how guerillas lived in the bush; how ambush and stealth were ways of life. After nearly four hundred years of forced slavery and exploitation, the organized resistance movement of guerilla forces swept the country with forceful waves of discontent in the 1960s. A visit to the Museum of Revolution in Maputo reveals the ultimate victory in the socialist coup in 1974. Take time from your enchanting holiday that finds you strolling vast beaches, swimming in the dreamy waters of the Mozambican coast, or diving the spectacular reefs, to visit the Museum of Revolution in Maputo, and be transported to a time fraught with landmines, AK-47s and bitter smiles. Take a step back in time to experience the true essence of Ilha de Mozambique, a quaint beautiful coral island located in the north of Mozambique, a World Heritage Site, and a living museum. The main attraction to visit the island lies within its fascinating rich history, hotchpotch of architecture, and diverse cultural influences. Imagine walking among the early settlers, soldiers, pirates and traders, every street and building is evocative of a bygone era. The sparkling gem of Ilha de Mozambique is divided into two halves defined by the old Stone Town and the Reed Town, each with its own character and attractions. Captivating culture and history is displayed in the churches, mosques, mesmerising colonial buildings, impressive fort, remarkable museums, and ancient Portuguese homes, but above all it is the unbelievable diversity of the local people that is intriguing. The once thriving island is slowly being restored to its former glory with charming guest houses and small hotels welcoming visitors. Walk along Avenida da Republica and browse the wonderful craft shop filled with an array of sculptures, beads and clothing items. There is also Books and Bottles, a fabulous little bookshop and a bottle store stocked with Belgium chocolates, espresso coffee and good wines. Explore the rare undiscovered beauty, lush vegetation and picture perfect beaches of Ilha de Mozambique. Visit the Chapel of Nossa Senhora and the Palace of São Paulo, now a museum, or take a dhow trip to nearby Goa Island for snorkelling, swimming and lazy days on a deserted beach. Unpretentious, pure and authentic, that is the true beauty of Ilha de Mozambique that will capture the senses of all taking time to embrace the extraordinary ambiance and magic of the island. "Your one stop BOOKING AGENT"
As one ambles along the beach in the early morning, the sun slowly rises out of the sea. Everything momentarily glows with a warm, golden hue and it becomes abundantly clear where the name 'Ponta D' Ouro' - 'Point of Gold' - comes from. It is a place of great natural beauty, a place where a huge natural dune, covered with lush indigenous vegetation, juts out aggressively into the warm Indian Ocean, creating a sheltered bay hugging a magnificent, unspoilt beach. Fronting onto this pristine stretch of golden-white sand the 'Mar E Sol' - Ponta D' Ouro timber frame log house development is being created. The development comprises of the construction of a fully self-contained residential and holiday home complex. Prospective owners will have the opportunity to invest in one of the most pristine beach complexes on the East Coast of Southern Africa. Just 6 hours from JHB and 4 hours from Durban, the development is easily accessible, located on the main beach and consists of self-contained luxury 145m² Timber Homes in a secure fenced complex. The Mar e Sol complex is presently under construction on the property fronting the beachfront of the town of Ponta D' Ouro. Definitive Title in these sites is held by Sunset Shore Investments (Pty) Ltd., a company registered and managed in South Africa. 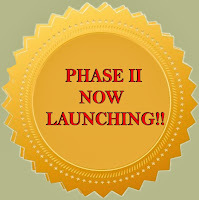 Prospective purchasers will buy shares in Sunset Shore Investments (Pty) Ltd, entitling them to rights of use in a house built on one of the sites in the Mar e Sol complex. The complex will be managed for the shareholders by Por do Sol Investimentos Lda, a Mozambican company. 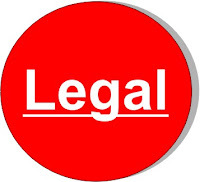 The legal structuring of Sunset Shore Investments (Pty) Ltd and all aspects of the Mozambican land use rights have been arranged and vetted by KPMG in Maputo andthe legal structuring of Sunset Shore Investments (Pty) Ltd has been Deneys Reitz, one of South Africa's leading firm of attorneys. All rights reserved - All Text and Images are Property of Coral Palm Development. Simple theme. Theme images by nicodemos. Powered by Blogger. 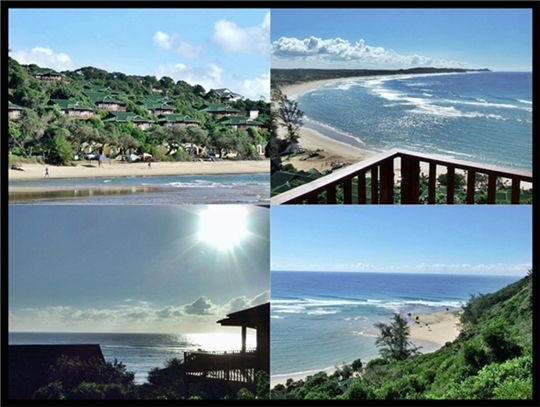 located on the Main Beach on Ponta Do Ouro in Southern Mozambique.